Thomas Organ completed their first wah-wah pedal, the Vox "Clyde McCoy Wah-Wah" in late 1966. McCoy was a jazz musician that utilized a cup mute to create a wah effect on his trumpet. Thomas Organ offered the "Clyde" pedal in their Vox Ampliphonic band and orchestra product line, initially targeting it for use with amplified brass and wood wind instruments rather than guitar. In a press conference covered by Billboard Magazine on April 8, 1967, Vox recognized that the true sales potential for the Vox wah was for guitar. They dropped their association with Clyde McCoy and renamed the pedal the V846 Vox Wah-Wah. Print ads featuring the Vox Wah-Wah for guitar commenced in May 1967. 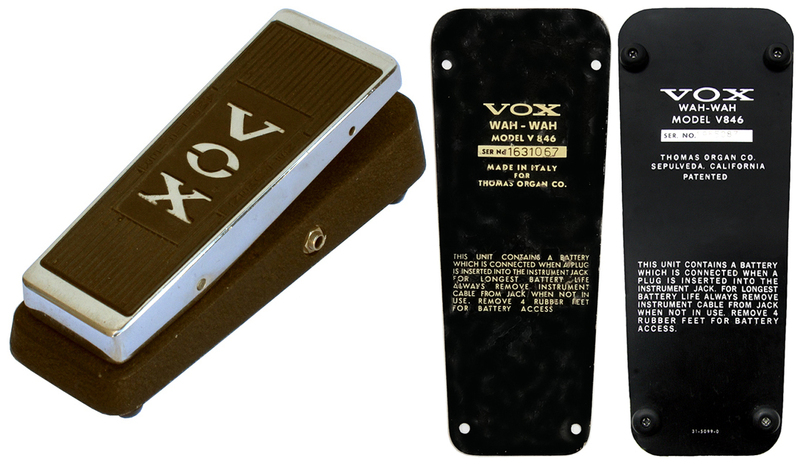 The V846 Wah-Wah was initially manufactured in early 1967 by Thomas Organ in Sepulveda CA. 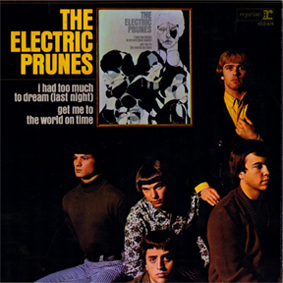 By mid 1967, production was moved to EME (Eko guitars) in Recanati, Italy. About a year later it was again shifted to JEN of Pescara, Italy. By the early seventies, production was divided between JEN and Thomas Organ in California. By the late seventies, the Thomas facility in CA was shut down. V846 production was then split between JEN and the Thomas International Corporation facility in Chicago, IL. Despite the fact that all Clyde McCoy, V846, Vox King Wah and Thomas Cry Baby pedals were constructed from the same schematic, significant tonal differences may be heard between pedals. 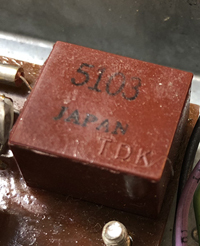 While any of the components used to construct the pedal may affect performance, two parts are responsible for most tonal differences: the 500mH ferrite core inductor and the 100kΩ control pot. Let's take a look at how these parts affect the tone of a wah pedal. 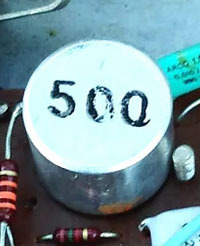 The five styles of 500mH ferrite core inductors pictured above were used in Thomas Wah-Wah and Cry Baby pedal production. These inductors were sourced from five different vendors and were critical to the tone produced by the pedal. As all shared a value of 500mH, one might think these inductors should all sound about the same but this was not the case. Differences in the design of their ferrite cores led to significant differences in tone caused by a electronic phenomena called "core saturation." 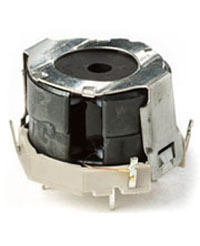 A ferrite core inductor is comprised of a coil of wire wrapped around an iron or "ferrite" core. In simplest terms, core saturation happens when the current in the coil exceeds the ability of the ferrite core to accept any more magnetic flux. This core saturation will create harmonics in the audio output not found in the original signal. These harmonic artifacts affect the tone of the pedal. It is possible to find any of the five styles of inductors in a Vox V846 Wah pedal. The Clyde Mc Coy plus many early Vox V846 Wah pedals utilized the highly revered "Halo" inductor, as shown in photos above. It gets its name from the silver ring-shaped clip that holds the assembly together. Vox wah expert Geoff Teese of RMC Custom Pedals has reported that two versions of the "Halo" inductor were produced for Thomas Organ, each with a different ferrite core and consequentially, somewhat different audio reponse. Many late sixties Vox V846 wahs produced in Italy by EME (Eko) and JEN utilized the "Trash Can" inductor while some seventies era Vox Wah pedals from JEN had the Fasel inductor. V846 pedals produced in America by Thomas Organ might incorporate either the "Stack of Dimes - 03" or the TDK 5103 inductor. These combinations seem to be the most prevalent but others are possible. A 100KΩ potentiometer controlled the sweep of frequencies boosted by the Vox V846 Wah-Wah. The pot was mounted inside the base of the pedal. The shaft of the pot was fitted with a pinion gear that engaged a toothed rack gear mounted to the underside of the pedal rocker. This toothed rack gear converted the vertical motion of the pedal rocker into rotary motion at the potentiometer. Potentiometers may be designed with either a linear or an audio (logarithmic) taper. Taper is the relationship between the position of the rotating control shaft and the measured resistance of the pot. A linear taper pot will show a proportional increase in electrical resistance as the control shaft is rotated, measuring one half of their total resistance when the control shaft is at mid point. An audio taper pot will exhibit much less than half of rated resistance at the mid point of the control. 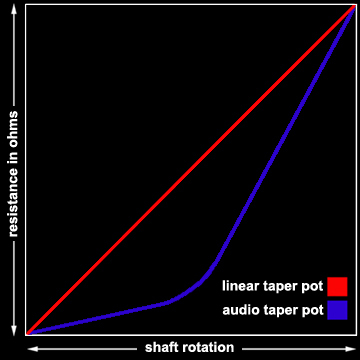 The electrical resistance of an audio taper pot will increase slowly to the mid point of rotation and then rise rapidly until it reaches the fully clockwise position (see chart at right). Vox sourced 100KΩ audio taper potentiometers for the Wah-Wah pedal from numerous US suppliers, including Centralab, Clarostat and Allen Bradley. However, the ICAR potentiometer installed in Italian made wah pedals is considered by many to offer superior performance. The ICAR pot had a hybrid design that blended a linear and audio taper. Unfortunately, age and use has caused many of these ICAR pots to fail. Many modern guitar effects pedals utilize a "true bypass" DPDT (double pole double throw) foot switch. In the bypass position, the switch allows the signal to pass directly from the input to the output jack without contacting any intervening circuitry. Vox did not design a "true bypass" foot switch into their Wah and Cry Baby pedals. Rather, they utilized a SPDT (single pole, double throw) foot switch that allowed a .01 uf coupling capacitor from the wah circuit to remain in the direct signal path, regardless of switch position. This capacitor reduced some of the treble in the direct signal. Many Vox wah owners have retrofitted a true bypass foot switch to improve the treble response of the direct signal. It is not difficult to determine the year of production for most items distributed by Thomas Organ. As Thomas commenced production in 1957, adding 57 to the first two digits of the serial number will, in many cases, give you the year of production. The serial number on the bottom plate of the Italian made V846 Wah-Wah shown above was 1631067. Adding 57 the first two digits of the serial (16) makes 73, indicating this Italian made V846 wah was produced in 1973. The serial number of the US made V846 shown above is 1995087. Adding 57 to the first two digits of the serial number makes 76. This wah was built in 1976.